It’s no secret that I love Facebook advertising. Last spring, I entrusted my dating life to Facebook ads. And, this summer, I used a basic Facebook ad campaign to rent out my condo. 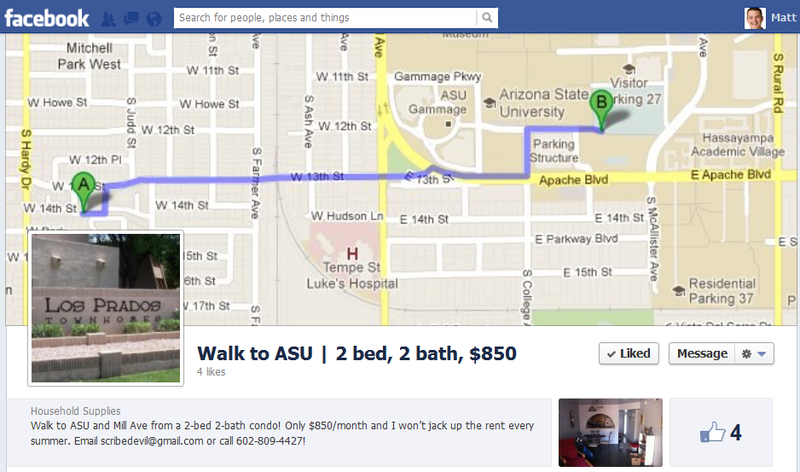 My rental property is walking distance to Arizona State University, so it’s highly attractive to college students. In late June, my tenant informed me he was moving out. I had a small window to move in new tenants between him leaving in late July and school beginning in late August. Ad creative. The obvious imagery for housing is a property sign or a swimming pool or, say, the house. I tried that approach. Meh. Studies have pointed to the effectiveness of smiling faces in ads. So, into my ad creative mix, I threw a face – my face. I wanted to grab my renters’ eye. And I wanted to differentiate against the corporate apartment complexes that were also targeting my audience. The call-to-action to “Rent my condo!” added an informal tone to the campaign. The results? Ads featuring my grinning mug drove 55.6% of the campaign’s reach, 74.3% of its impressions, and 77.8% of clicks. Ad targeting. The best thing about Facebook ads is the granularity of targeting options. Demographics. Interests. Geography. It’s all there. For this campaign, one ad group targeted those who lived within 10 miles of ASU. The other targeted all ASU students nationwide. Why nationwide? I figured my targets might still identify as residents of their hometowns (for the same reason that college students don’t get local driver’s licenses and remain registered to vote back home). Plus, if they were home for summer break, they may need a rental when they returned. The results? The nationwide ads drove 54.2% of reach, 73.5% of impressions, and 80.0% of clicks. And, most importantly, the combination of national targeting and my smiling face landed my renters. Wait, didn’t you say something about free? Yup! And the ads? Well, the ads were free too. Facebook wants you to take its platform for a test drive. It knows that its granular targeting and cheap clicks are addictive. And it wants to get you hooked so bad that it regularly offers up $50 and $100 ad credits. Right now, you can get a $50 credit for Facebook ads by filling out a form and chatting with a Facebook rep. It’s the perfect opportunity to play with Facebook ads for free. Have fun! Very cool stuff! I’ve noticed you can’t manipulate the copy of ads anymore, so how did you do this? Do you have to make a post on the page and then select that post as your ad? I’ve searched Facebook FAQ and haven’t been able to find an answer. For “What do you want to promote?”, select your pagename instead of “a specific post …”. For “People will see”, select “A new ad about …” instead of “stories about …”. Excellent post & strategy Matt! I love the (mindblowing) targeting that Facebook allows, and your post is a brilliant use of it. Cheers!